The world is turned upside down. When the latest US tariffs on $200 billion (£153bn) of Chinese imports raised international concerns over escalation of trade disputes, some western media blamed China for not opening its market wide enough, thus undermining the multilateral trade regime with "unfair trade". However, China should not take the blame for the wrongs of the US. To clear the misperceptions, the Chinese Government released a white paper titled The Facts and China's Position on China-US Trade Friction, which, in my view, emphasises three key points. First, China's opening up is based on its national conditions. The openness of a market is never absolute or unconditional. It is always based on the national conditions of the country concerned. China is no exception. According to IMF statistics of 2017, China's per capita GDP was only $8,643, ranking the 71st in the world and accounting for one seventh of the US and one fifth of the UK. More than 10 years ago, I served as Assistant Governor of Gansu, one of the least developed provinces in China, and visited some of the poorest places there. I know from personal experience the severe challenges China faces in terms of development. With more than 30 million people living in poverty, more than 80 million with various disabilities and 15 million people in need of a job every year, there is no denying that China is the largest developing country in the world. This is the basic national condition of China. Despite this, China has never compromised the level of openness of its market. 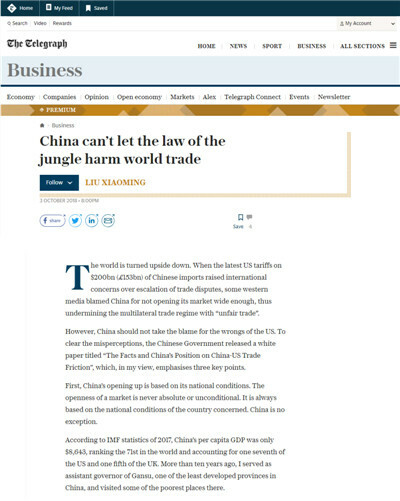 On the contrary, China has fulfilled its WTO commitments to the letter. Take the trade in goods as an example. By 2010, China had lowered average tariffs on imported goods from 15.3% to 9.8%, eight years ahead of scheduled cuts. But China did not stop there. Through further cuts on its own initiative, China had lowered the trade-weighted tariffs to 4.4% by 2015, which was significantly lower than many other emerging economies and developing countries, and was close to the levels of the US (2.4%) and the EU (3%). In services trade, China's commitment covers 9 of the 12 core services sectors according to WTO classification, namely 100 of the 160 sub-sectors. This is close to the average level (108) of developed countries and way ahead of the average level (54) of other developing countries. Second, China is not only a beneficiary but also a contributor. Since becoming a member of the WTO in 2001, China has grown from the world's sixth to second largest economy. In this process, China's resources, such as low-cost labour and land, match well with international capital and technology, which has quickly generated enormous productive capacity, promoted the development of the global industrial chain and value chain, and boosted world economic growth. Since 2002, China has been the most powerful economic engine, contributing nearly 30% of world growth every year. China has also grown to be the world's second largest importer and the largest trading partner of more than 120 countries and regions. Moreover, by providing interest-free loans and personnel training for the least developed countries, China has played an active role in "Aid for Trade", a programme designed to help these countries take part in global trade. Its further plan to import $24 trillion of goods in the coming 15 years and the scheduled first-ever International Import Expo this coming November are demonstrations of China's determination to deliver tangible benefits to the world. The US moves pose severe challenges to the world trade regime and put the WTO in jeopardy because they are in essence against the WTO principles of non-discrimination, including the most-favoured-nation obligation. By emphasising "fair trade" and "absolutely equal opening up of markets", the US ignores the differences between countries in development stages, resource endowment and industrial strength, or weakness, and turns a blind eye to the right of developing countries to seek development. This could only deal a heavy blow to the economy and industries of developing countries, and cause further unfairness in a wider scope. China is not only upholding but also promoting the multilateral trade regime. This is the third emphasis of the White Paper. As the old saying goes, "Do not throw the baby out with the bathwater". The WTO, though not perfect, must not be abandoned. China supports an open, transparent, inclusive and non-discriminatory multilateral trade regime, and the necessary reform of the WTO. Such reform should be a step-by-step process that accommodates the concerns and meets the aspirations of the majority of WTO members, and safeguards their rights and interests, especially those of the developing members. Moreover, the outcome of such reform must be based on the consensus of the WTO members. Right now, members should make it a priority to address the problems that threaten the very existence of the WTO: the selection of Appellate Body Members and the abuse of US domestic laws, namely the national security measures under Section 232 of US Trade Expansion Act of 1962 and the measures pursuant to Section 301 of US Trade Act of 1974. Development and reform of the WTO cannot be achieved before the existence of the organisation is ensured. A Chinese adage goes, "It is difficult to lift a heavy object alone; it is easier if you do it with many others." Without the multilateral trade regime with the WTO at its core, the world economy and trade would be exposed to the storm of protectionism and unilateralism. 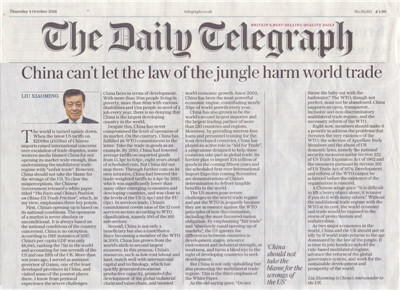 As two major economies in the world, China and the UK should not sit idly by if world trade returns to the age dominated by the law of the jungle. It is time to join hands to uphold the rule-based multilateral regime, advance the reform of the global governance system, and work for the sustainable development and prosperity of the world.